In Adidis Ababa, Ethiopia, Bontu Workineh was born on May 28, 1997 to her parents, Sintayehu Gossa and Abebeche Sisay, and is one of three children. In Ethiopia, Bontu had a stress-free and carefree life. Respect was emphasized on and given to leaders, including her teachers who invoked fear through punishment with a blue plastic stick. There was no discrimination against her for how she spoke or the color of her skin. She got to celebrate her favorite holidays and festivities of her country with people who loved and immersed themselves in the culture just as much as she did. This all changed though. When she was 11-years-old her family was forced to leave everything behind in Ethiopia in order to quickly and safely flee to Kenya and take refuge. This abrupt departure from the country they loved was due to a shift in government. Their government was supposed to be a democratic parliament but was being run like a dictatorship. Her father was one of the targets of this new government because of the conflicting views of tribes. Her father was of a different tribe from the new government, and at the time was working for a nonprofit that supported people from his own ethnic tribe. The government was infuriated by this nonprofit and in response, they started arresting and targeting those who worked there, thus forcing the Workineh family to become refugees. When they arrived in Kenya, the United Nations took on their case to help find them a sponsor who would provide them food, safety, and shelter. 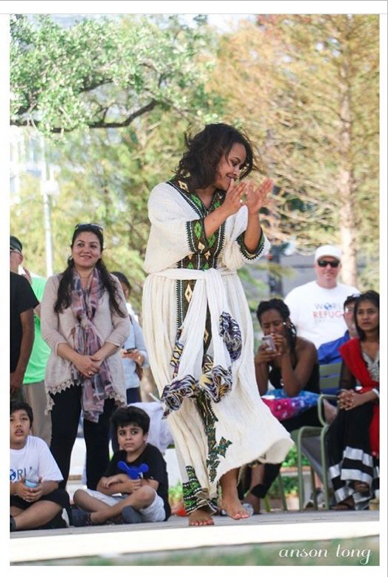 They were sponsored by a charity, Interfaith, who helped bring their entire family to the United States–Houston, Texas, to be exact. The charity paid for the airline tickets, their food, and housing until they were able to get on their own two feet. Her dad started his own taxi company, as well working as a translator at hospitals, and her mom worked at HomeCare taking care of elders. Eventually the two were able to start their own successful Ethiopian restaurant until Hurricane Harvey recently destroyed their location. Before their success in the States, their family went through a lot of struggle. Her entire family was starting off completely fresh and had just left behind all their close friends and family back home in Ethiopia. They knew no one. Bontu herself only knew the basics of the English language such as “Hi,” “How are you,” and “Thank you,” but struggled to keep up a conversation. Her father already knew English, but her mother still cannot understand much to this day. This adjustment affected them all making it harder for Bontu because, unlike a child being able to run to her parents for help, her parents were struggling with the same things as she was. All they could do for her was offer support and relate to what she was dealing with. Before moving to America, Bontu had always seen America as the country of hope. It was the dreamland where everything was right and could be right, where everything would be nice, including the people. There would be no problems in American society unlike back home. It would be like heaven on earth. That view changed instantly. Life was not stressfree like it was back home. Bontu realized how much people worried here about work, money, or school. She started to pick up on this way of thinking even though she didn’t want to. She was placed in a class specifically for students who spoke English as a second language. She was bullied from elementary to middle school for how she spoke and for looking different. Homesickness set in, and she began to feel like everyone and everything was out to get her. Bontu felt different–like she didn’t belong–and she felt lonely. She just wanted to be around her friends from back home. She watched those same kids who bullied her give no respect to their teachers, blatantly talking without being called on or talking back, but no punishment was given to them. She even had had no idea that racial discrimination existed until she came to the U.S. where she experienced it herself first hand, even at school which was supposed to be a safe place. The heavy realization that this country of hope was just as flawed as her own country set in. The United States is a melting pot that accepts other ethnicities and cultures, but people are not always open minded. From racial profiling to racial discrimination to stereotyping, Americans do not educate themselves in the other cultures around them which creates an immense lack of understanding of immigrants and refugees. Bontu believes this needs to change. She is contributing to this change through her own success since coming here. Despite bullying and a language barrier, Bontu eventually was recommended for an advanced English course by the time she reached her freshman year of high school. She has continued to work hard in school seeking a higher education at Marymount University where she studies health promotion. She wants a college degree so that she can gain a career that will help her give back to the community, especially other refugees who are coming or who have already arrived here. She believes health promotion will give her the chance to educate refugees who have arrived here in health education. Most refugees are coming from third world countries and lack health education on diseases and illness, as well as how to live a healthy lifestyle. Though she has gained a lot of life experience and has been given the opportunity to experience what she thought was the perfect country, her culture and home are what she is proud of most. If given the opportunity to go back to her own country if the political situation changed, she and her entire family would definitely move back to Ethiopia. As much as the States appear to be perfect to outsiders, they are not. Every country, including Ethiopia and the U.S., is flawed.